There has been a lot of behind-the-scenes material on the series over the years, but sadly, most of it is difficult (if not impossible) to get hold of. I will try to go through the complete behind-the-scenes features (or, at least, as complete a list as I have been able to make). In addition to the documentaries, interviews and Agatha Christie features listed below, there are some rumours circulating that a behind-the-scenes feature was made in the early 90s, though I somehow find this quite unlikely, as they didn't have the DVD/BluRay market we have these days, so why should they make "extras", unless it was to be used for a television broadcast? The interviews/programmes I've tracked down from the early 90s are all television broadcasts, not DVD extras. 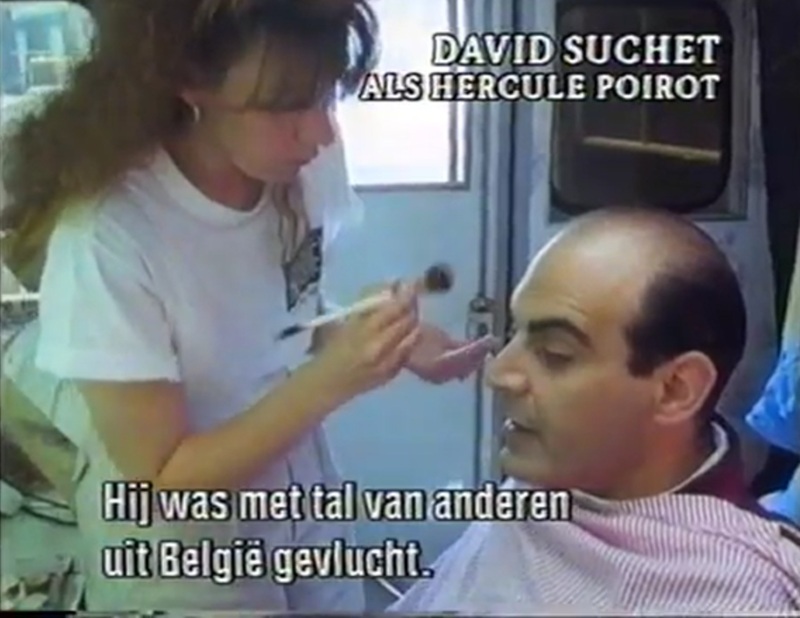 This seems to be the earliest documentary in which David Suchet comments on his character. It also features a detailed discussion of Christie's literature and her two main detectives. It seems to have been made in conjunction with the 100th jubilee (centenary) of Christie's birth. The documentary also features the only "meeting" between Miss Marple and Poirot (a.k.a. Hickson and Suchet). As of now (December 2012), most of it seems to be availale on YouTube (http://www.youtube.com/watch?v=fvKPXEOIWNI). 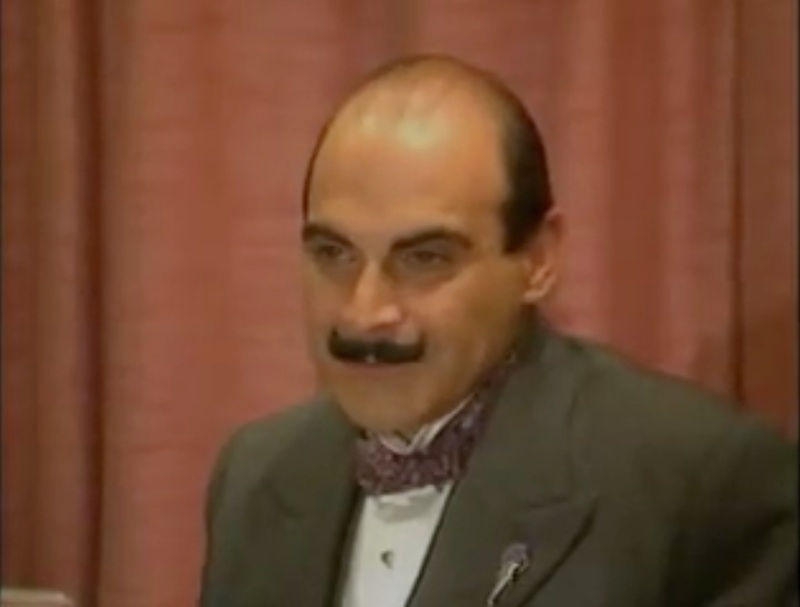 A documentary on Agatha Christie's life, including an interview with David Suchet on the set of The Mysterious Affair at Styles. Narrated by Joan Hickson! Currently available on YouTube (http://www.youtube.com/watch?v=hqnrNSxJ2QM). 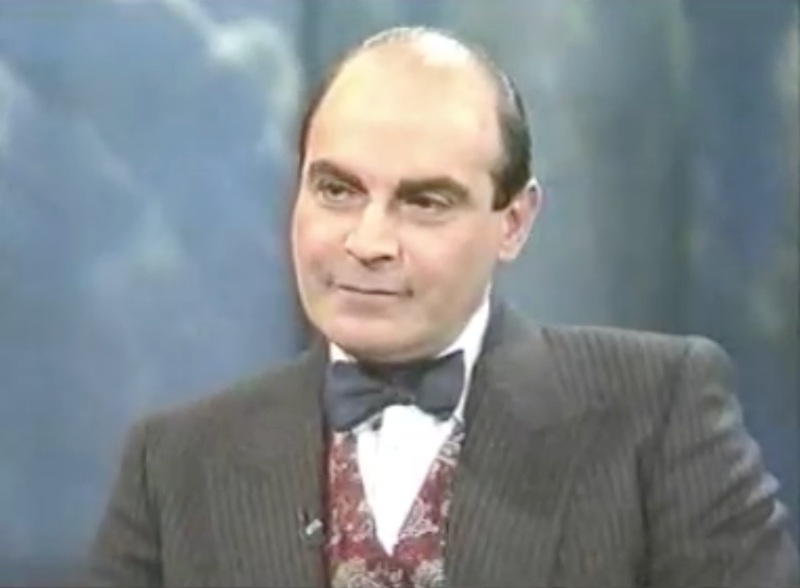 An oh-so-typical 90s show on Christie's characters, featuring interviews with a lot of experts as well as actors such as Angela Lansbury, Peter Ustinov - and of course David Suchet. Also available (2012) on YouTube (http://www.youtube.com/watch?v=bMh2tyjhHII). This seems to have been lost. At least, I've never managed to track it down anywhere online. I've found to captions: 'Nigel Williams investigates the 10-day disappearance of Agatha Christie, an incident which remains a mystery to this day. With the help of David Suchet and a hotel murder weekend team, he hopes to unlock the secrets of Christie's enigmatic life.' AND 'Nigel Williams profiles Agatha Christie's famous detective Hercule Poirot, explains the enduring appeal of the eccentric Belgian and examines the author's sensational ten-day disappearance'. Judging from these, the documentary seems to centre on Agatha Christie's life more generally rather than the TV series specifically. Probably intended for DVD release, I think these are included in the "complete collections" regularly released by ITV, as well as some separate DVD releases of Series Nine, but I have never managed to lay my hands on them. Apparently they include an interview with producer Margaret Mitchell (Five Little Pigs), an interview with Mitchell and David Suchet (Sad Cypress) and an on-location featurette (The Hollow). The final featurette, from Death on the Nile, I have managed to get hold of. This was available on YouTube for a while, but I can't seem to find it anymore. This documentary follows the production of the entire tenth series, from The Mystery of the Blue Train, via After the Funeral and Cards on the Table to Taken at the Flood. It includes interviews with several of the main actors and actresses. I don't think it's available online at the moment (apart from in a version dubbed into Russian), but it will probably be included in the final box set, and it is frequently aired on ITV3. This is the brilliant mini-documentary series, which consists of five minute interviews with David Suchet. 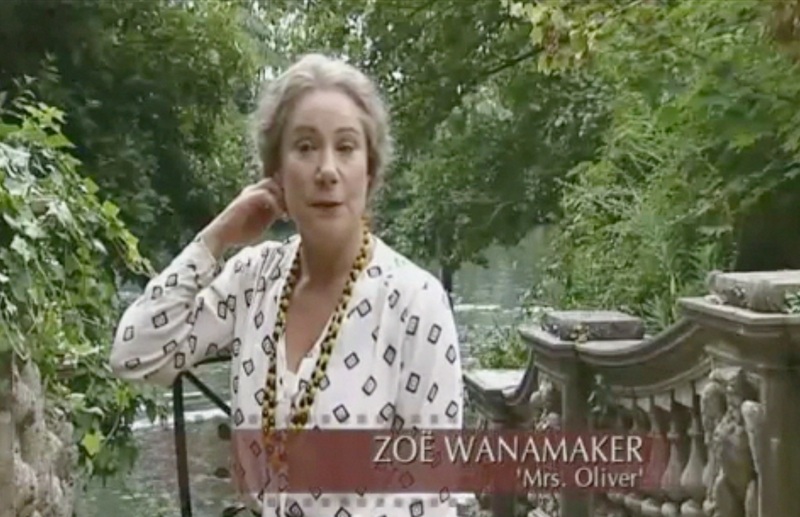 All are currently available on YouTube, thanks to the wonderful Sanna from the David Suchet Fansite (https://www.youtube.com/watch?v=AKz8-jwj50U). An episode called "Poirot's Closest Call" was apparently also supposed to have aired, but I have never managed to track that one down. Judging by the TV guides for that particular weekend, it seems to have featured 'The Mystery of the Spanish Chest' (in which Poirot is almost stabbed by a duelling sword). 2006 was certainly a wonderful year for behind-the-scenes material! This documentary is probably the best and features interviews with everyone from the first producers, script writers, main cast (including Suchet, Fraser, Moran AND Jackson!) and experts. It is part of a major series profiling the most famous ITV detective series. Available on YouTube (2012), again thanks to Sanna (https://www.youtube.com/watch?v=RHRiXmYg9yY), and I think it's also available on some US DVD releases. I haven't been able to locate this online. But judging from information on various websites, the premise seems to have been for the viewers to choose their favourite detective (aka cop). What Poirot is doing in a COP competition, I have no idea... Anyway, it only seems to have featured some clips from the show and some archive footage from an interview with Suchet. 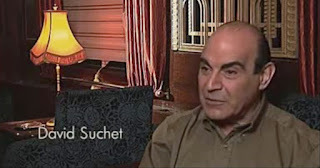 An absolutely delightful documentary, with David Suchet taking on the journey of the Orient Express. He details the history of the train, as well as some stuff on Christie's book and his portrayal of her character. An extra on the US/UK DVD releases of Series Twelve. Currently available online thanks to Sanna (https://www.youtube.com/watch?v=t0KhaKurWQA). Also available in a 'Masterpiece Special' version, I think. A rather nice featurette behind-the-scenes of the production. Interviews with main cast members, director and production crew. Currently available on YouTube. This is a rather interesting 'documentary' which was part of a series outlining the main crime dramas on ITV and encouraging the audience to vote for their favourite detective. 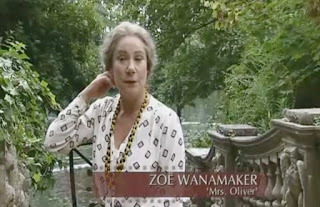 The episode features interviews with Agatha Christie's grandson, Pauline Moran, Anthony Horowitz and David Suchet, among others. Not available online at the moment. A series outlining words from crime drama series (e.g. murder, hanging, Marple, Poirot). Yes, I know. They seem to be running out of ideas! 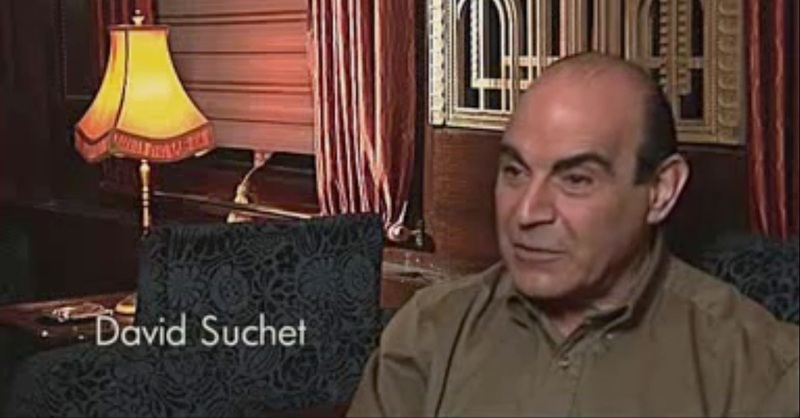 I watched this myself when it was aired, and from what I can remember Suchet only features in a tiny archive interview. Not available online. A series outlining the connections between crime dramas (e.g. Shaun Evans appears in 'Whitechapel' and stars in 'Endeavour' (yup, I told you, they're running out of clever ideas)). The series apparently profiles Agatha Christie's Poirot. Not available online- or at least I haven't been able to find it. 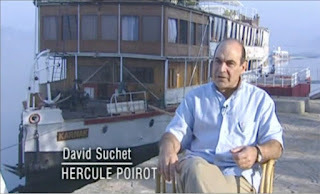 UPDATE MAY 2013: "Longish", a commenter, reminded me that the Agatha Christie documentary I mention below has now aired and is available on YouTube (http://www.youtube.com/watch?v=JgP_UfPhOVs). There's a brief clip from Suchet's trailer on the set of Curtain, but apart from that this fascinating documentary focuses on Agatha Christie. For most fans, this is an absolute must-see, and Suchet is excellent. There's a short interview included on the complete DVD box set that was released by ITV. He details the process of becoming Poirot. A decent interview. 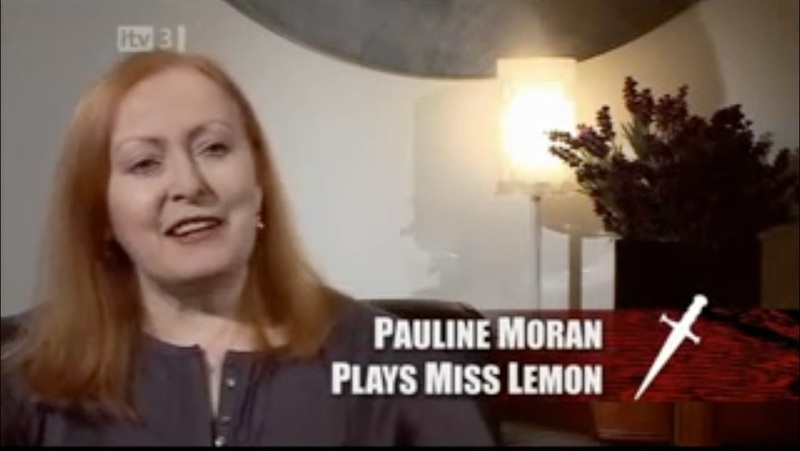 This documentary was broadcast by ITV directly after Curtain. It is a brilliant account of Suchet's commitment to the character. Available on YouTube. In addition to these, there's the behind-the-scenes book by Peter Haining, Agatha Christie's Poirot: A Celebration of the Great Detective (1995) which should be available through Amazon or Ebay. 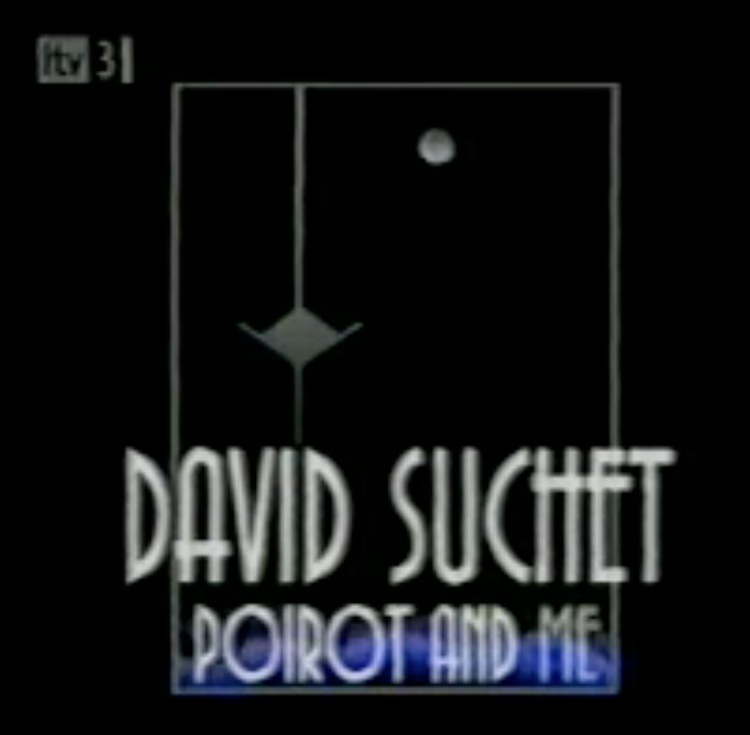 As of late 2013, there's also David Suchet's absolutely brilliant autobiography, Poirot and Me (2013), which I suggest is an absolute must-have for any Poirot fan. 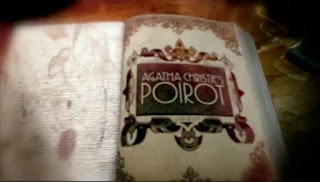 I can't wait to read "Poirot and Me." Oh, great! Didn't know that. I think "Poirot and Me" will be such a good read. What an opportunity to hear the story from the man himself. Definitely on my wish list this year! Yes, thank you for reminding me! 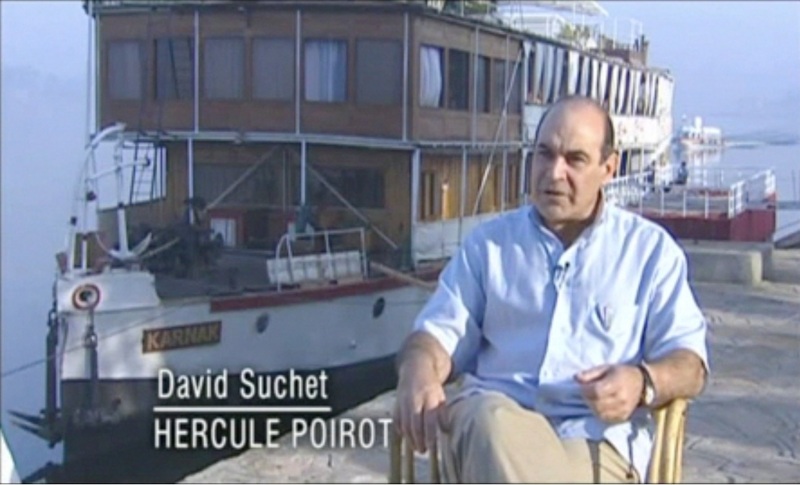 I wrote this post before it had aired, so I could only refer to it as "an Agatha Christie documentary presented by David Suchet (March 2013)" in the post. But now, of course, it's even on YouTube, which is great!